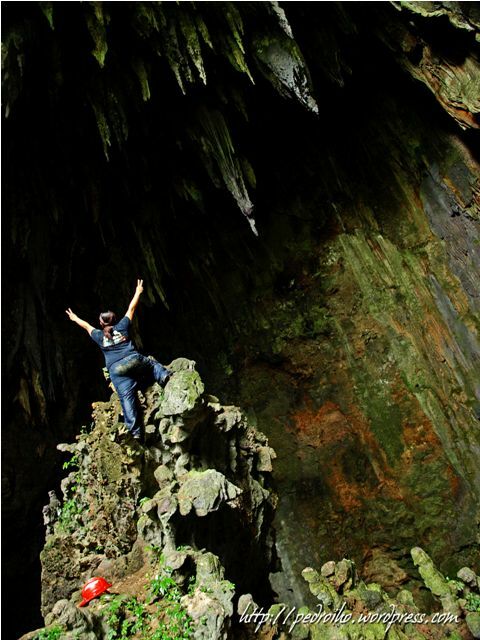 What I mentioned above was all true, but that did not scared us to go on exploring the cave of Barangay Dakudao, Municipality of San Isidro. There are first timers who had the opportunity visit and explore the cave. Travel time from Davao City (Beside Victoria Plaza) to Barangay Sawata in the Municipality of San Isidro took 2 and a half hour. We had our stop over for 1 hour and took our breakfast and registration process while we were at Sawata. 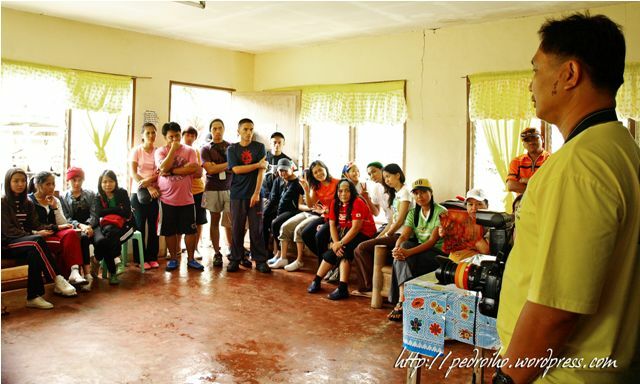 We moved on for 14 kilometers before we reached the Assembly area at Barangay Dakudao at around 9:15 in the morning. 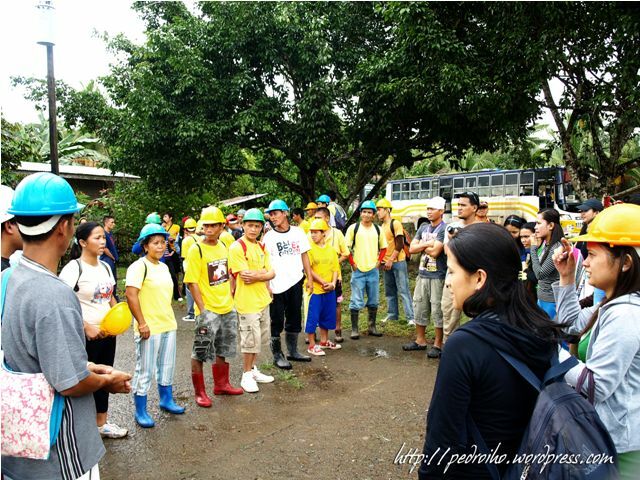 Orientation and briefing was done by the Barangay Captain as well as the tourism coordinator of Kapalong Mr. Roderick “Nonoy” Parcon who devotedly protect the caves under their jurisdiction together with the rest of his team. Guide introduction - "know your guide"
Do’s and Don’ts are introduced to the participants as well as the distribution of guides in every 3 participants per group. 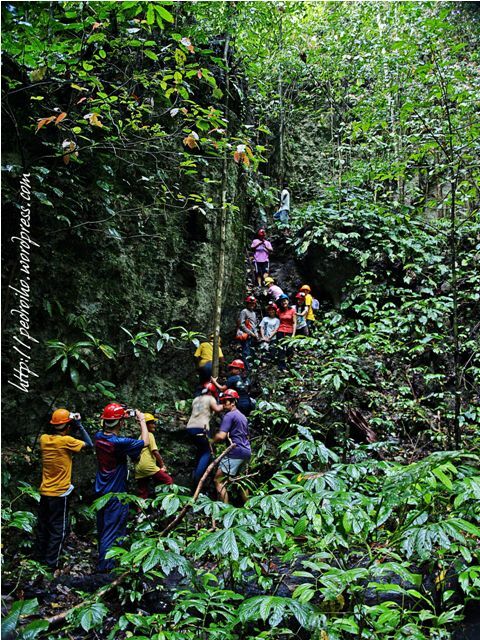 The participants were divided into two groups (Group 1 and 2) for we simultaneously explored two caves namely Kabyawan and Sayaw caves. Our caving guides had the skills and the good attitude towards the participants. 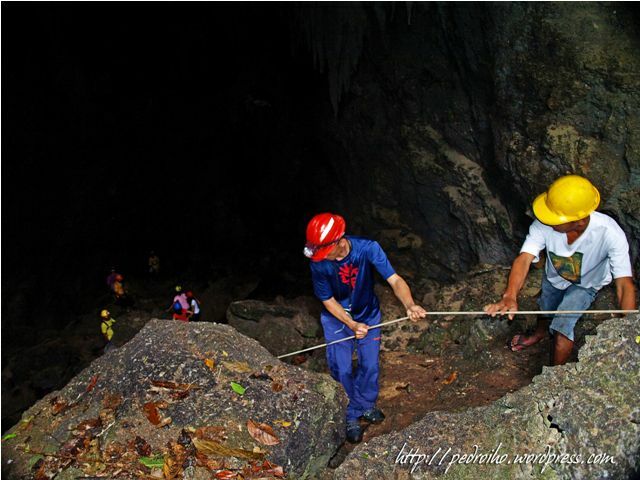 They are honed under a training program initiated jointly by Davao Speleological Society (DSPEC), the Davao del Norte Provincial Tourism recently for the preparation of 10th National Caving Congress this coming April 6 -10, 2010. 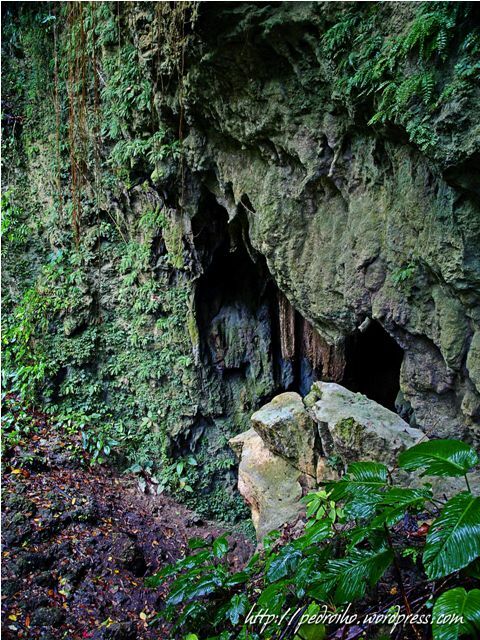 The first cave our group explored was the Kabyawan Cave (Haven of fruit bats cave) which are home to a large colony of miniature fruit bats. An 8 minute trek from the road down to the entrance of the cave and a smell of bat droppings “guano” can be smelled just as we are near the mouth of the cave. Lush greens of flora along the trail are mostly of legumes, cultivated cacao trees and some forest trees which I cannot identify with hanging roots. First glance, the cave entrance was big but steep, good thing the guides brought along a rappelling rope for us to hold on while going down. 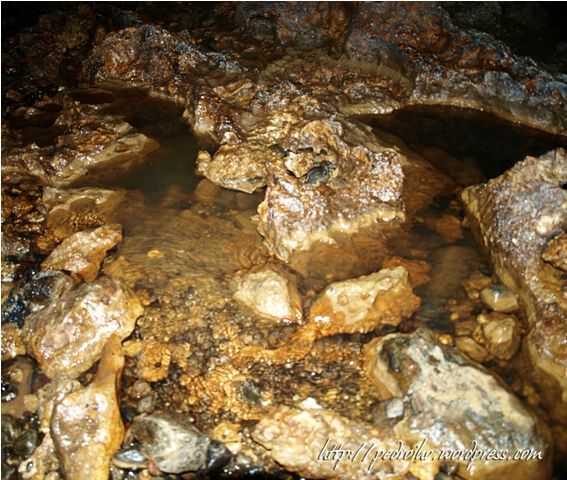 Most of the cave floor at the entrance was covered with bat droppings. Big rocks with large crevices between greeted us when we are down the cave before we work our way down and deeper into the cave. This is not my first time to enter a cave but it feels like one. 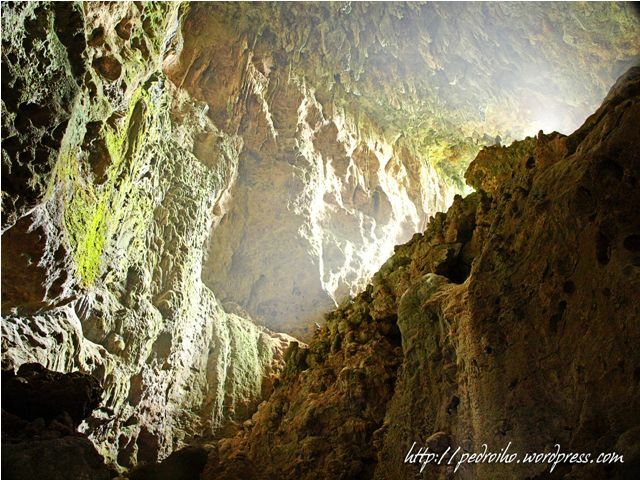 For sure other participants are amazed by the stalactite and the stalagmites with some rock formations. The cave system inside has a large chambers filled with stalactites and stalagmites and has a passages through watercourses up to waist deep that gives a scene that’s memorable for the years to come. 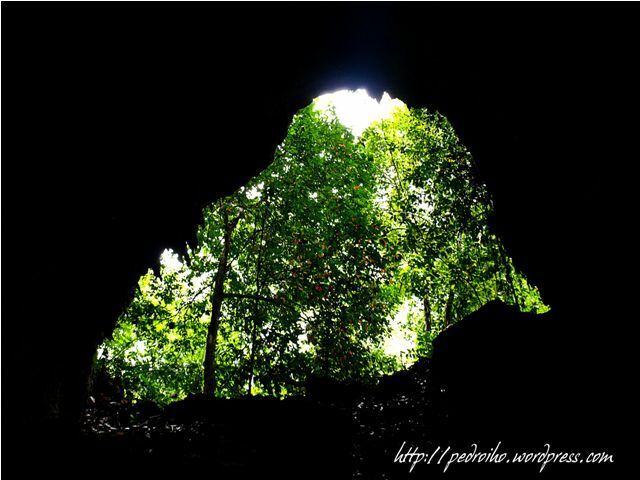 We encountered a King Cobra “Banakon” in spiral body position just on top of the rock near our path and guides said that there were two of them possibly mating but I only saw one while some of the participants saw both of them just a few meters away from each other while on our way to the exit point the cave. I know there was a huge risk to have been attack by a banakon if disturbed but we instilled in our mind as what we learned on our cave orientation and briefing to not touch anything was applied, we’re safe. It was a nervous scary moment for others but with mind focus, we’re all safe. Exit point of the cave was a huge chamber with a boulder of fallen rock that we have to maneuver before we’re out. Stamina was tested for this cave and the experience was worth it. Camaraderie was molded into the participants even if they just met that day.